In the idyllic city of Olympus, a paradise amidst the ruins of World War Three, humans and bioroids (artificial humans) live together in peace. The city itself is controlled by a giant supercomputer, Gaia, under the auspices of the bioroids, whose superiority over humans makes them perfect governors of this utopia. However, not all humans are happy and a terrorist group known as the Argonauts is working to destroy bioroids. Deunan Knute and her partner Briarios of the E-SWAT team must work to uncover who is behind the Argonauts’ plot to kill bioroids and their motivation. This thirteen part series follows on from a franchise that began with Shirow Masamune’s manga and has seen several film entries. This takes the series back to its roots, reminiscent of the 1988 animated film, with a brightly coloured aesthetic to Olympus and often more humorous take on the characters of Deunan and Briarios and their relationship as a couple. The screenplay by Junichi Fujisaku is densely plotted, with the Argonauts plot running throughout while several subplots spin off from this. Fujisaku also worked on Ghost in the Shell: Stand Alone Complex (similarly based on a Shirow Masamune manga). Many of the episodes are structured round a single mission, with E-SWAT assigned to protect somebody, or investigate something, creating individual moments of triumph or failure amid the ongoing investigation. It is also interesting to see more focus placed on the two protagonists as a couple, as they bicker and play off one another well. 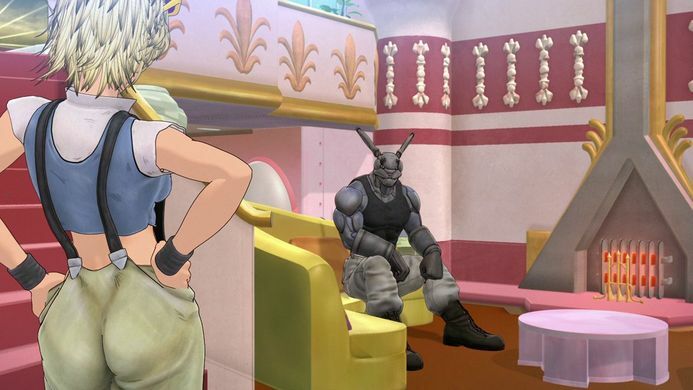 Appleseed has always referenced Greek Mythology, in its character and place names (Athena, Olympus, Poseidon), and each of this series 13 episodes are named for one of the labours of Heracles. This doesn’t distract from the story to a great extent, but likewise for those unfamiliar with the mythology it offers little in the way of explanation. There will often by flashes of mosaics or statues depicting a scene from mythology, but the link to what is happening in the show is tenuous. When it does work it is a powerful tool, showing the eternal nature of particular struggles, of humans trying to discover their purpose or standing in the world, and other theological and philosophical questions that the series raises. At other times these cutaways appear only to serve as filler content or meaningless scene transitions. Unfortunately, there are several flaws in this series that put it on a lower rung to other entries in the franchise. The CGI anime style that has become a mainstay since its reincarnation in the 2004 Appleseed film seems to have taken a step backwards here. While it does provide an interesting aesthetic it can be distracting due to the contrast between handdrawn and digitally rendered images. The animation is occasionally jerky and unnatural and background characters often appear to have had little time spent on their animation, thrown around like plastic toys. The city of Olympus also seems strangely unpopulated, with empty streets and a noticeable lack of vehicles and people. This is circumvented in many places by having the episode set in a unique location, such as a submarine or a building where there should not be many people present. Appleseed XIII is a mixed bag. It is hard to pinpoint exactly where the series went wrong, aside from the animation which could be chalked up to budget constraints. It is worth a watch for fans of the series as it does give you more of the main characters, the technological and philosophical debates that are familiar from other entries, however things seems somehow small scale here and you never feel much for many of the side characters. For those new to Appleseed it would be better to begin with the films.